At Steps, we recognise that funding your rehabilitation, or managing your neurological condition, can be expensive. Your Steps therapist will help you access any funding you may be eligible for including the National Disability Insurance Scheme (NDIS). The scheme is being rolled out progressively throughout Victoria. 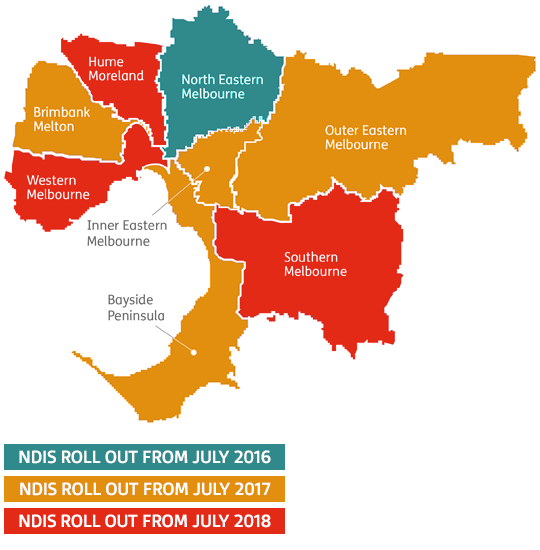 The map below shows when the NDIS is coming to your area. Steps Neurological Therapy Services is a registered service provider with the NDIS. We provide therapeutic supports through Physiotherapy, Occupational Therapy and Exercise Physiology interventions. Steps’ therapists are currently working with participants of the scheme and have experience with the various funding structures available. These include self-managed funding, management through an Agency or management by the National Disability Insurance Agency (NDIA). The role of your Steps Therapist is to work with you to address your independence goals outlined by you in your NDIS service plan and create new learning opportunities to assist you to develop new skills. This may include individual therapy, set up of home programs, community gym and hydrotherapy sessions, sourcing equipment and completing SWEP funding applications. Please contact the clinic for our most current fee schedule. On the spot claiming is available at our Hughesdale rooms for private health insurance funds through Hicaps when your account is paid at the time of service. Contact your health fund directly to find out what services you are covered for. Under the Enhanced Primary Care Program (EPC), Medicare rebates are available for a maximum of 5 allied health services per person in a calendar year. These rebates are available to people who have a chronic or complex condition being managed by their GP under an EPC. The individual needs to be referred to Steps by their GP prior to the rebated session. Steps Hughesdale offers on the spot rebate for Medicare EPC sessions following full payment of your account. Steps will invoice your funding body directly so there is no out of pocket cost to you.